Entering a new week and my weekend passed so quickly, I didn't feel that I just had a weekend this week *sigh*. My husband and I arrived in Jakarta from Singapore on Saturday noon and had a traffic jam on the way home for couple of hours - it took us longer from the airport to our house than from Singapore to Jakarta LOL. It just tired us. Miss the kids and finally got home around 2.30PM, saw their happy faces were priceless. Hubby's medical check up result was all good but he got an infection for his sinus that has to be treated for 2 weeks. His sinus has been gone bad lately and went to many doctors in Jakarta but with no good results. That was why we decided to check with the doctor in Singapore. Pray for him so the medicines will work well on him and his sinus can be treated well too. I met two wonderful persons, Tona and her cute son, Kimi on Saturday. Tona is one of the bento moms from Singapore. You can see her blog here. We went out for lunch, had a chit chat, and did a little bit of shopping on the way back to the hotel I stayed. I had a great time with her and Kimi. Thanks a lot Tona for everything! I hope we can meet again next time. Although I couldn't get much online when I was Singapore but eventually I manage to get online from the hotel's wi-fi and was shocked to see the tweets about Japan's earthquake and tsunami on Saturday. I was waiting for my hubby from the hospital at the hotel room and my heart sunk to see the pictures from CNN news about the earthquake and tsunami. Thanks God that all friends that I know were ok and safe. This is a traumatic experience for the people living there. I know this experience has been exhausting both mentally and physically to my friends. My thoughts and prayers are with them. Thanks to Makiko Itoh, the writer of The Just Bento Cookbook and the owner of Just Bento and Just Hungry blogs. She has been worked very hard to tweet and keep updating about the latest situation in Japan. You can follow her on her twitter @makiwi. And if you would like to make some donations, please check on her post here. This week my kids will sit on the mid-test. As usual, they will be dismissed from the school earlier and have lunch at home. So this week, I will just prepare small portion bento or snack bento for them. I made onigiri bread stuffed with pork floss for them and put some fruits inside the box. Beautiful super cutie bentos.. I never thought to make onigiri bread. Oh Lia, hope your hubby's sinus clears up.. I went through that and it was extremely painful. It was such a painful weekend wasn't it? So hard to watch what is unfolding in Japan.. All our hearts and thoughts go out to them.. Your bento is so cute, again !! I have friends in Japan too and I felt the same until news from theim. I hope yours will be fine. Hope your hubs´ sinus clear up soon. It might be very bothering.. So cute bentos, lovely bears! Are those rabbit picks new? Dear Lia, please take care. When we see so much tragedy we figure out how life is precious but delicate and we should really appreciate we are so lucky. Let´s keep positive and hope the chaos will end soon. Hope his condition clears up quickly with medication. Thinking of all the victims and their families, going through so much. Wishing them strength for their healing. nice bears and the dragonfruit looked so yummy. 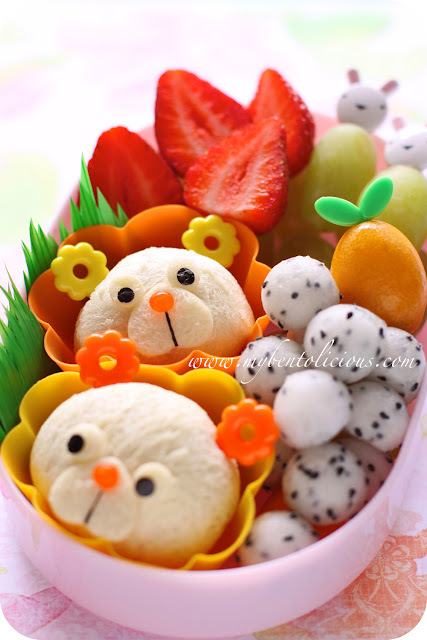 a silly question: any tutorial on how to do the bears onigiri and how do u carve our such perfect dragon fruits balls? tks. @sheri fujihara chen : Hope the same too! Keep thinking positive and pray that God will give them strength. Wow I really surprised that the owner of this blog is Indonesian. I want to make a post about bento and I do blog walking from many blogs until I find your blog. May I copy your image and share a little bit of your blog to my post? Maybe your bento can change Indonesian people's opinion about bento. Please let me know if I can save your image. These are two cute bears. The bear sandwiches are just too cute...:)!! Gorgeous and delicately sweet bento as always! @Cooking Gallery : Thanks a lot CG! @Bunda zahraa : Thanks a lot Zahraa!